Inishbofin Rib Charter is located on Inishbofin Island. The unique Island of Inishbofin is only 10 Kilometers off the North Connemara Coast. The Island is only ninety minutes from Galway City. The island itself is a haven of beauty, boasting magnificent scenery. With cliff top walks to the coast with sandy beaches on all sides. It is surrounded by small uninhabited islands which are home to some of the main seal colonies in the area. Inishark is a large desreted island west of Inishbofin which the last people left in the early 60’s. A RIB is a rigid inflatable boat. 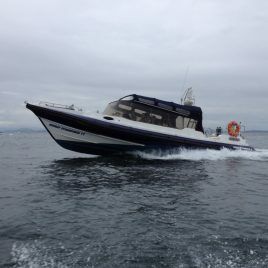 Our boat is an eleven meter REDBAY purpose built cabin RIB. It has the advantage of giving the choice to our passengers of sitting inside in a warm dry cabin or outside absorbing all the elements the Atlantic has to offer. It is fully licenced to carry 12 passengers by the Dept. of Transport. It comes equipped with its own life raft and all the latest safety equipment. All our passengers are supplied with Approved Life Jackets. Water proof clothing is also available if desired.